THE ROBBOS' CARAVAN PARK = free! This is only a day late when it comes to posting on the blog ... it was a very warm day yesterday and it is going to be even warmer today! Neil decided to wake me up very early yesterday morning - 5.12am to be exact so in turn I tapped on Kouta to wake him up and he did his usual and completely ignored me, it wasn't until we bot started to roll up the sleeping bags that he decided to stop playing 'possum' and got up. It was just beginning to get light at that time in the morning but enough light for us to pack up. We left the campground at 7am .... our earliest start yet. Knowing that the day is going to get up to 35 degrees our main concern was whether there was going to be a wind with that - Elders said no which meant that it would get to its' 35 very quickly. It was wonderful riding along the roads at that time of the morning ... not even the locals were out and about! The road is very quiet and we continued on the road that we took yesterday but took the Bendigo turnoff and headed toward Laanecoorie Reservoir which had some lovely campspots and the best was probably at Ankers which is a popular boat launching spot and most probably not suited to bush camp there on the weekend! 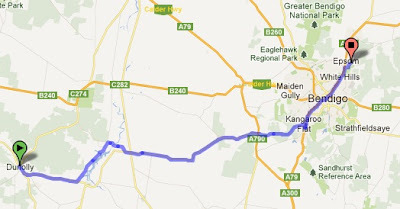 Just after Laanecoorie we joined the main road to Bendigo that goes through Lockwood and Kangaroo Flat. We noticed a definite increase in traffic. The road has a small shoulder but the traffic was courteous to us. The road also flattens out a fit until Lockwood from there you cross over the Calder highway and start climbing for about 5km (an easy climb) at 50km you have a down hill in Kangaroo Flat ... where I might add there is an Aldi - the first since we left so we bought a few supplies and picked up the bike path that runs through Bendigo township. We have never been on this path before and it is great as it runs parallel with the main road through Bendigo. The only down fall is that you have to cross the roads rather than go under but that is no problem. At one point they send you on the road but we just went onto the highway for a few kms and then rejoined the trail at the huge fountain. Going through the parkland there is great as it is very shady and at the time we went there weren't alot of people around. Basically the path follows the storm water drain so if you loose the path just look for the storm water outlet! We got to Leannes at 1pm and boy was it hot then - so happy to get into air conditioning! Kouta just loves it here!